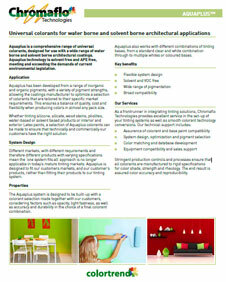 AQUAPLUS™ PH is a solvent-, APE- & VOC free, polychlorinated copper phthalocyanine pigment by Chromaflo Technologies. It is designed for water- and solvent-based architectural coatings. It exhibits broad compatibility, wide range of pigmentation and flexible system design. AQUAPLUS™ PH shows good light- and weather fastness. Recommended for wood stains, and interior & exterior latex paints. Please note, these HSP values are estimations. It is based upon the “like seeks like” principle. It splits an ingredients interactions into three parameters; δD (Dispersion force interactions), δP (Polar forces interactions) and δH (Hydrogen bond force interactions). Hansen Solubility Parameters can help you find a wide range of products that are predicted to be compatible with AQUAPLUS™ PH. A practical determination of these HSP values would provide higher certainty. Learn More.